Sometimes, you just have to let the Wookiee win. 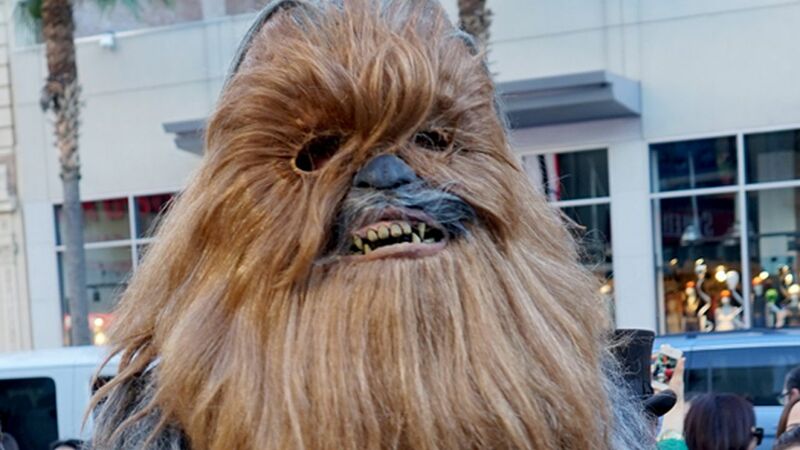 It all began when Candace Payne broke the Internet with her viral video, in which she can't keep from cracking up while wearing a Chewbacca mask. Now it appears Hans Solo's co-pilot is hoping to force a battle for views. Chewy takes to Facebook Live inside his modest car (his other vehicle is the Millennium Falcon), and then the hilarity ensues as he pulls out a Candace Payne mask. Chewbacca guffaws as the mask 'emits' the sounds of Payne's incredibly funny laugh. It's a moment no beast or man should miss. Payne's video, by the way, has been seen more than 40 million times. Her family was surprised by Kohl's, who surprised her family with more Chewbacca masks and other goodies for Payne's birthday.